Garda (Titling) was initially designed in 1998 inspired by the letters of the Renaissance master caligrapher Francesco Cresci. The typeface contains only capitals with assorted alternate letters and ligatures in three distinct styles, the first one closely follows the the original drawings of Cresci, the third, is a low contrasted sans serif and in the middle stays short serif version with low contrast. All versions share similar proportions, each one with its own merits and may be used in combination or individually. We have not upgraded Garda since its release as a postscript typeface in 2001 and we’re proud to introduce a revised and expanded version in OpenType format. The new version, Garda 2.0, includes: extended glyph set, old style figures, more alternates (arranged in stylistic sets and accessible through open type features), more ligatures and other useful features. The fonts are available as family or in individual styles. While lining figures are considered the standard matching style to use with capitals, there are also situations where the use of old style figures would the appropriate, or even desired. That’s why we decided to include a nice set of old style figures in the three versions. We have expanded the number ligature available in each of the three styles, versions Two and Three have a set of 10 ligatures while version One is limited to 6. All ligatures are accessible through the open type feature ligatures, and do not work if you’re using any of the stylistic sets. The number of alternate glyphs was considerably increased. Alternates are now allocated in stylistic sets ranging of 1 to 5. Each set a certain attribute and degree of modification from the default design. For instance, in Stylistic Set 1, you have alternate glyphs where the difference from the default glyph is only subtle, such as a narrower H or a R with a shorter leg. While in Set 3 you have an open form of R or P and in Set 5 a raised L.
Garda was included in Typographica.com’s list of Our Favorite Fonts of 2005. 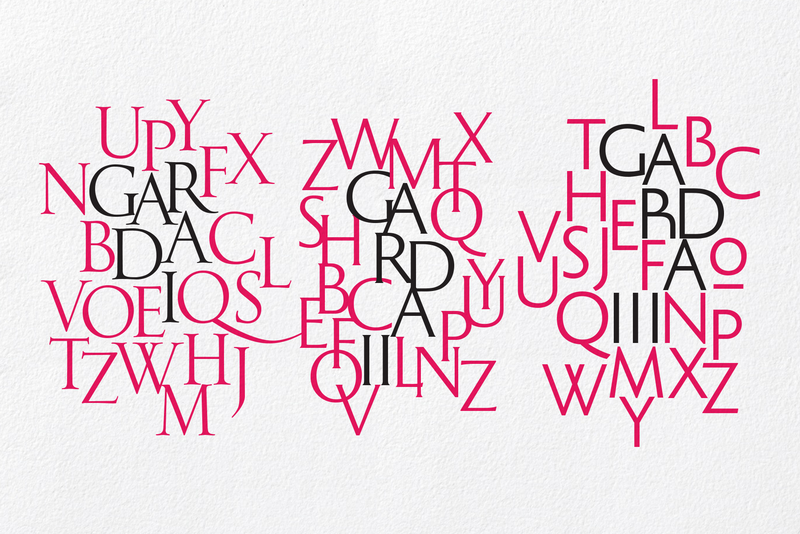 Garda is available in three feature-rich styles in Roman only.